Y'all KNOW I love me some stripes, right? You'd just have to take a glance at one of my Pinterest boards to see that. However, I learned about this blognomenon called Stripemania that's being held by the Decor8 blog when I read a post about it in Maryam's Pamplemousse blog. Basically it's bloggers who post a picture of themselves wearing something with stripes (a shirt, a dress, a blouse, etc) and then you get added to this ENORMOUS Pinterest board where you can view all the other striped bloggers. 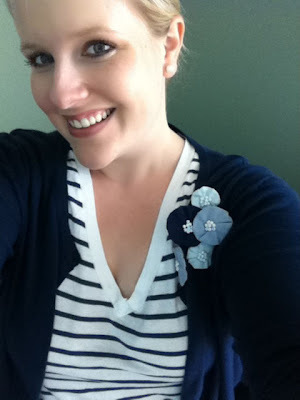 I am so excited to be a participant in the Stripemania roundup! I wore my stripes today so I thought I'd post a photo and enter it into the blog roundup. Here. We. Go! You can click here to learn more about Stripemania and to enter on your own! Stripemania runs until June 12th! Oh, and I love that cardigan! Selah, that is awesome. Hmm...we'll have to see what I wear tomorrow now! :)That striped shirt is way cute. Oh, and the cardigan is from Old Navy. I seriously wear it like once a week!